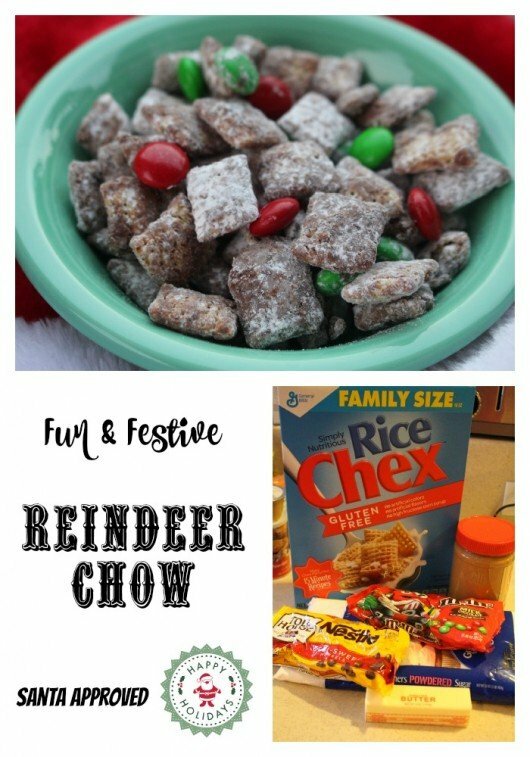 You are here: Home / Favorite Recipes / Fun and Festive Reindeer Chow! IF you commented on this post for the giveaway prior to 12/18/15 at 1:30PM CST, I have your comment! You are still entered to win. You will not see your comment below though. Sorry! Several years back I was handed a baggie of what looked like messy, muddy cereal. Um, thanks? I am not sure why I chose to taste this concoction, maybe I had skipped lunch? I did taste it though, and I haven't looked back! It is now something I look forward to every single year. What was this bag of scrumptiousness? Puppy chow! Except in this case, we are making Reindeer Chow! 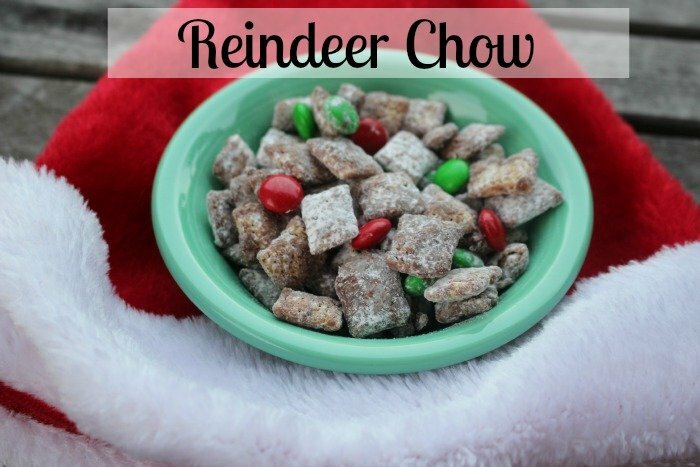 Reindeer Chow is very very similar to Puppy Chow, except it has a festive dash of red and green M&M's! I made this for my kiddos class and handed it out with some printable bag toppers. Unfortunately, the past few days have been so hectic that I did not get a pic of the Reindeer Chow in the baggies, but they were adorable! To make this for 2 classrooms worth of kiddos, I doubled this recipe (but I made it in 2 different batches because it's easier to work with). FYI, WinCo shoppers should head on over here to grab great coupons on many ingredients in this recipe! To celebrate the fact that winter break is ALMOST here (just HOURS away! ), I am giving away $10 in PayPal! To enter, just simply click here and then come back and let me know what recipe you would love to make with Chex cereal (in the comment section below)! You must have a valid PayPal account to enter. This giveaway is self hosted, I am the one and only sponsor. This giveaway is not associated with the makers of Chex Mix, WinCo or PayPal. This giveaway ends on 12/23/15 at 11:59PM! 1. Find a large surface and cover it with wax paper, or just use your biggest baking sheet. Lay your chex out as flat as possible. Go ahead and make sure your powdered sugar is ready and measured out and your M&M bag is open...your hands are about to get messy! 2. In a microwave safe bowl, melt the chocolate chips, butter and peanut butter together until smooth and creamy. Microwave for about 30 seconds, stir, 30 more seconds, stir, etc until it is nice and smooth. 3. Drizzle the chocolate mixture all over the chex mix. Once you have it all dispersed, use your hands and really get in there! Make sure each piece is covered. Work quickly because you need to add the powdered sugar before the chocolate fully cools/hardens. 4. Once every piece is covered, add your powdered sugar and repeat. 5. Finally, add your festive M&M's! I love this stuff! I know you will too! You can doctor this up anyway you want. I've seen people add peanut butter chips, pretzels, different candies, etc. Have fun with it! I’d love to try your reindeer chow! My kids would love this! And that red velvet truffle looks incredible! I love original Chex mix ! Chex Carmel Chocolate Drizzle sounds so good!!! I’d love some muddy buddies, YUM! Muddy Buddies are a favorite around here! Would love to try and make the cereal treat bars! I would love to make the red velvet chex party mix. We love red velvet cake and thsi would be an easy way to sample it and take it on the go.